Evelyn Delores Hamilton obituary. Carnes Funeral Home. Dec 1, 2016 Dear Family and friends, type the following URLs into your browser to read or listen to the Bible-based articles concerning the condition of the dead and the hope of seeing them again. : tinyurl.com/mezwv23 and tinyurl.com/jyp4yl4. I hope you find comfort from God's wonderful promise. 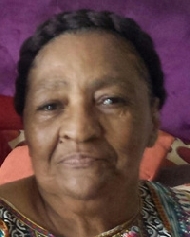 Evelyn Delores Hamilton affectionately known as Mom to us and "Pumpkin" to many others, was born 09 August 1937 to Joseph Tousant and Evelyn Jones. She is preceded in death by her parents and Daughter-In-Law Sharon Tousant. She was the oldest of five siblings. She attended Galveston schools and spent part of her career working for Early Childhood Learning Center and the Texas Department of Transportation/Galveston Island Ferry. Her memory will linger in the hearts of her children; Cynthia (Charles Sr.) Sennette, Richard "BoHam" Tousant, Bobbi Holman, Tracey (Richard) Canada, Samantha (Derrick Sr.) Kirks, and Daphne Daniels (William III) Benson. Her siblings; Linden Smiley, Larry (Cheryl) Smiley, Shirley Bell and Mickey Smiley. 15 Grandchildren and 15 Great-grandchildren, nieces, nephews, and a host of family and friends. Mom was one of Jehovah's Witnesses. She was a possessed a spirit of candor and was a real jokester, who loved to be surrounded by "pretty things", plants, flowers and shopping! Memorial services will be held at 11:00 am on Saturday, 26 November 2016 at Carnes Funeral Home 3100 Gulf Freeway in Texas City, TX 77591 The family will receive guest immediately following the services in the Carnes Banquet Hall. Memorials ma be sent to the Funeral Home.